Forget about the business cards and make connections, practice your elevator speech and be strategic in what you say and ask other people. 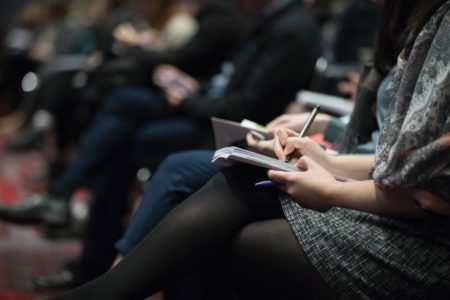 At the beginning of the year, many of us are preparing our calendars and ourselves for the must-attend conferences and trade shows throughout the year starting with Inman Connect New York. As a 15-year real estate veteran, I’ve attended a vast array of conferences. To be honest, when I first attended some them, I thought they were a cheerleading session, and frankly, I wasn’t sure why everyone was so excited. I used to think that these conferences were all about the content, and some of them are; there are some great speakers and “ah-ha!” moments. But I found out the secret to getting more value out of attending conferences — networking. The value is in the connections you make at the conference. In fact, those relationships can last much longer than the ephemeral motivational high you get from most conferences. Before we begin, let’s talk about a big “no-no” in networking. We’ve all seen this, you know the person who walks up says, “How ya doin’?” and hands you a business card. Even worse, there are some people who will give you a stack of cards, you know, just in case you come across someone stuck in the last century who needs this person’s services. Finally, the worst wannabe networkers aren’t networkers, they just put a card on your seat. At best they are “marketing,” at worst they are too scared to actually network. Let’s make sure that’s not you! If you do decide to run through a crowd handing out cards, those cards are likely going into a database where you’ll get all the “This month in real estate’s” you could ever want. Honestly, in case no one else will tell you, no one wants your business card — unless they feel there’s a connection. If you’re at ICNY, you’re likely in real estate, but this question will be asked more than any other. Be ready. This new connection could be an agent, a vendor, a broker or a celebrity, it doesn’t matter, you should have this ready to go in the real world, don’t forget it at the conference. Need some help? Read the how to write a mission statement guide. If you nail the “why” portion, then it makes the elevator pitch much easier. Also, time yourself. Elevator pitches are called that because you need to be able to get it out in the time it takes to ride in an elevator. Remember the acronyms S.T.A.Y. and W.A.I.T. Ultimately to make the best connections you need to listen. This may seem like common sense, but from my own personal experience, I can tell you that most supposed “networkers” are big talkers. Be a listener, it’ll be much easier to like you. It’s hard not to talk when you’re a salesperson. Try STAY. As in “stop talking about yourself.” Most people love talking about themselves. Let them, just don’t let it be you. There’s nothing worse than trying to make a connection with someone at a conference and meeting unpreparedness. If you’re at ICNY, then you’re at a real estate event. You should be ready with your elevator pitch. Don’t just prepare your elevator pitch, be ready with questions. Visualize yourself having different conversations. Let’s say you are an agent from Atlanta and you meet someone from Minnesota, be ready with questions about his or her market. Here are a few questions for you to use while you’re there. Is it a seller’s or buyer’s market in your area? Where do you find most of your business? Is there a specific referral source or client type that you like working with? What’s one of your biggest challenges right now? What is it that made you want to do X (job, work with that company, be an agent)? What was your best takeaway from your last conference? Good networking can be truly life-changing. Go to ICNY looking to help whomever you come in contact with. If you go with this “add value” approach, then you’re sure to stand out, be remembered. I’ll leave you with a story that Ben Ganje told me about networking. Ganje went to an open house in Edina, Minnesota, where he sells real estate for Lakes Sothebys. He didn’t really want to go, there was really no prospect of business. However, Ganje wants to be the expert in Edina so he goes to some of these. There he met an architect who was also “browsing.” Because Ganje approached the architect as a fellow Edina admirer and not as a salesperson, they hit it off. The short version is that they ended up exchanging information, and over time, they developed a relationship that — wait for it — turned into business. However, the architect never listed a single home with Ganje. Through networking. The architect has introduced Ganje to others, some of which have done direct business (like regular referrals) with Ganje while others have introduced Ganje to more clients and so on. This year, aim to add value, make a few friends and measure your ROI at ICNY with the number of new relationships you’ve built. Just remember, relationships are work. They don’t just happen.